To follow the blog post on the Most Iconic Super Bowl Commercials, I’ll be talking my favorite commercials from this past Super Bowl. These are the ones that stood out to me the most and did a fantastic job with their short time frame. Christinina Applegate is yelling at her kids making a fuss in the backseat. At first glance, this is looking to be a car ad, but takes an immediate turn when Applegate stomps on the breaks and yells “If you don’t stop I will eat all of you alive right now.” She looks back to reveal the kids are actually m&ms attached together on the new product, M7M’s Chocolate Bar. The red m&m says he’d prefer she break them apart to coincide with the new product. 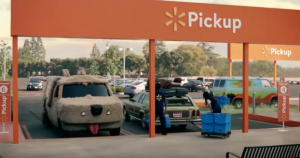 Walmart uses nostalgia in a unique way to attract audiences’ attention. To promote ordering groceries online they use some of the most iconic forms of transportation from television and film. 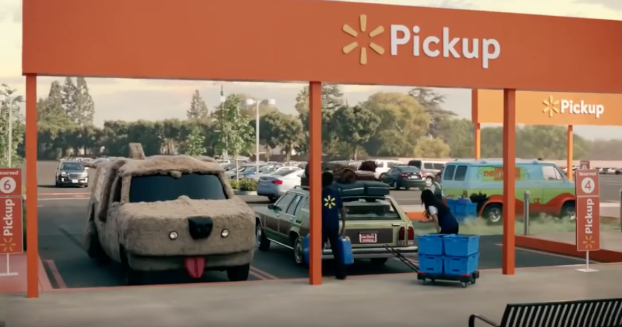 Famous cars are shown rushing to Walmart to receive their online orders. These iconic modes of transportation include Cinderella’s carriage, The Batmobile, Lightning McQueen, the Ghostbuster’s car, the Mystery Machine, and much more. Very creative and thoughtful output by Walmart. Olay takes a play at Mike Myers using the vampire slayer herself, Sarah Michelle Gellar. The commercial plays out like a horror movie trailer, up until Sarah’s phone can’t recognize her face. This is comedic and relatable because face detection devices have a hard time recognizing your face in the dark. Sarah explains that Olay is actually the reason her face isn’t detected because it’s beautified it. You can’t help, but laugh and give Olay a pat on the back for that. Dilly, dilly or winter is coming? Bud Light and Game of Thrones team up for this one. We get a reference to “Dilly Dilly” at first, but then see a recognizable figure from the iconic HBO show, Game of Thrones. Both worlds tied well together and were able to promote each other in a unique way. That dragon and the infamous theme song at the end were like icing on the cake. Promoting the 100th NFL season in the best way possible, the NFL puts a number of football legends in a room together to throw around a football. It’s nostalgic and endearing. Even if you’re not a huge football fan, this commercial makes you smile. Okaaaay. This commercial is clever and hilarious. “Is Pepsi okay?” is a stab at those restaurants that serve Pespi, not Coke. Pespi uses that phrase as the theme for their commercial explaining that Pepsi is more than okay. They do this with the help Steve Carrell, Lil John, and Cardi B. Carrell brings that comedic aspect, John says his signature “OKAY!,” and Cardi slays with “Okurrr.” It’s modern and brings together a diverse group of artists. 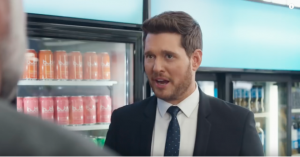 Doesn’t this commercial make you want to say, “Aw.” Michael Buble is back and made it known during the Super Bowl. Bubly’s commercial has Michael Buble calling their products “Buble” instead of “Bubly.” A customer and store worker call him out, but he’s persistent on calling them “Buble.” When a young girl comes up and pronounces his last name as “Bubly” he corrects her and says it’s “Buble,” contradicting himself. The end of the commercial shows the talented singer scribbling out the “y,” and writing an “e.” It’s adorable and heart-warming, especially to see him back in the media. 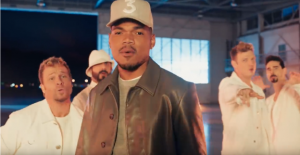 Backstreet Boys AND Chance the Rapper? Interesting mix, yet it worked. Chance remixes the classic “I Want It That Way” to represent Doritos remixing their original flavor with heat. The Backstreet Boys are back and still have moves. The music makes you want to jam out. Doritos brings a taste of a classic from the 90s with a modern twist from today’s era. It was a smart move on Doritos because Millennials and Gen-Z are familiar with both artists. Amazon promoted it’s signature product, Alexa, in a comedic way that comes off as a meme. By using the phrase, “Not everything makes the cut,” Amazon displays how innovative it has become through the years with the help of notable actors and Freddie Mercury. Even though a lot of the products they “developed” didn’t work, Amazon has that potential to continue to enhance their company and products.